A gorgeously designed building with twelve floors and rooftop facilities, Zee Avenue has all you need for the perfect time in Lahore. Spanning over 11 kanals of land, with 8.5 kanals of covered area, its imposing façade never fails to impress. With the twelve-storey Zee Avenue you can enjoy a quintessentially Lahori experience in a luxurious setting on Cooper Road, amidst a rich milieu of historical landmarks such as Badhshahi Mosque. Punjab Assembly and Faletti’s Hotel are only two minutes away, so the project is in an enviably beautiful area. Zee Avenue, spanning over 11 kanals, offers a great mall with all the brands you could ask for and a food court with some great eateries. To top it off, the project includes Ramada Hotel & Suites, blending tradition, comfort, style, and convenience. It also has a rooftop with beautiful views of the whole city, complete with a restaurant, gym, spa facilities, and even a helipad. Indulge in the ultimate shopping experience at Zee Avenue. With the top national and international brands under one roof, the mall has been specially designed according to international standards, providing the freedom to immerse yourself in a world full of endless charm and exceptional convenience. This mall spans over the lower ground, ground, first, and second floors of the building, offering ample options for all, along with a food court. Enjoy an extensive range of eating options at Zee Avenue Food Court, where the world’s most sumptuously rich cuisine is available for you to satisfy your taste buds. Housing the best in food from a variety of local and international chains, you’ll always find something to fulfill your appetite at the Zee Avenue Food Court, with options for the whole family. 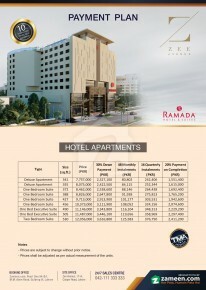 This project is exclusively marketed by Zameen.com, which makes it a paragon of quality and reliability. 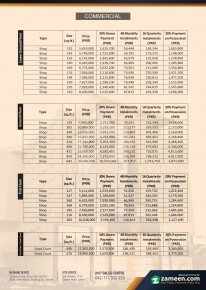 Each project Zameen.com markets offers transparency and clarity at every step of the way and clients can expect to get all the guidance they require to buy property in Zee Avenue. Area: 341 Sq. Ft. - 355 Sq. Ft.
Area: 372 Sq. Ft. - 456 Sq. Ft.
Area: 490 Sq. Ft. - 505 Sq. Ft.
Area: 135 Sq. Ft. - 210 Sq. Ft.
Area: 139 Sq. Ft. - 642 Sq. Ft.
Area: 127 Sq. Ft. - 265 Sq. Ft.
Zee Avenue is a new phenomenal project being developed by Liberty Builders. The renowned builders have a well-established name in the international market and the brand name has earned considerable recognition through involvement in mega projects like HVAC Kuwait, Master Fixer Dubai and Liberty International. The company is known for its focus on architectural standards, and works with architects with virtuosity and finesse. Every project Liberty Builders undergoes is sure to follow the highest international quality standards and efficient time frames.